Left Behind is an upcoming American apocalyptic thriller film directed by Vic Armstrong and written by Paul LaLonde and John Patus. 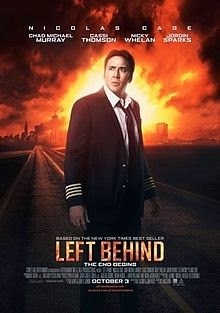 It is based on the series of novels of same name, written by Tim LaHaye and Jerry B. Jenkins, and is a reboot of Left Behind: The Movie. The film is set for an October 3, 2014 release and is rated PG-13 for Thematic Elements, Violence/Peril and Brief Drug content by the MPAA.